"Those hands have seen a lot of life," the shiny-eyed nurse said as she looked at Cora Reatha Carroll, called Granny by most, who looked impossibly small in the grip of a hospital bed. Her hands, wrinkled with time and dotted with sunspots, do indeed have a story to tell. In 1920, when Granny was a baby, she reached for the warm embrace of her papa, James Larramore,"a good man who wouldn't speak bad about nobody" and her mama, Cora Larramore, who didn't always stay out of gossip, but who was a Godly woman nonetheless. With shiny blue eyes and a mop of red hair, she was surely the cutest baby who ever lived. Born into abject poverty, she had to work hard from the start, but her parents taught her to always lend a helping hand. During the Great Depression, they would offer plates of food to stragglers looking for sustenance. During Granny's life, she was always willing to offer help to family, friends, and neighbors. From a young age, little Granny kept her hands busy by helping mama in the kitchen, papa on the farm, and playing cards with her brothers. With eight siblings, she learned if you want to do something the right way, you have to do it yourself. Despite growing up in a time and into a family in which survival took precedence over formal education, Granny always enjoyed learning and reading. As a child, she read the bible with her mama and, though she had to drop out of school after the eighth grade to help at home, Granny remained an avid reader. Since she devoured books of all genres, her hands flipped through millions of pages during her lifetime. In 1938, she gave her hand in marriage to James Carroll, who preceded her in death. They had four amazing children: Frances, Wayne, Sherron, and Kathy. Eventually, she gained three more beloved children: sons-in-law Tom and Donnie and daughter-in-law Shelley. Much to Granny's delight, she kept her hands busy tending to and spoiling her five grandchildren: Tommy, Leeann, EJ, Craig, and Jamie. Then she was blessed with four great-grandchildren: Lane, TJ, Ryan, and Drew. Granny's absolute love of babies and children kept her spirit young and her heart open. Her family know they are the luckiest people in the world to have known and been loved by such a dynamic woman. When some of her grandchildren were small, they'd stay the night at her house and she would thoroughly spoil them by buying toys and candy, such orange circus peanuts from the IGA, and clanging around the kitchen at five in the morning to fix their favorite breakfast. Once the meal was prepared, she woke the children by gently placing her hands on their faces and saying, "Babe, huddle cakes are ready... there's plenty of syrup." Throughout her life, Granny used her hands and to create clothes and quilts. As a child, she learned to sew by piecing newspaper clippings together and by making dresses for her handful of dolls. The dolls were the recipients of her careful attention since she only acquired one a year for Christmas and would treat them like her babies. After mastering doll clothes, Granny made dresses for herself, then her mama, then her sisters, and she eventually created and sold clothes within the community. At age 96, when staying in the hospital and sharing stories, she said, "I don't want to brag, but I'd look at any catalog and make an outfit that looked just like it." Her narrow shoulders swelled with pride and her eyes were bright as she recalled a time when some girls from school found out she was the one who made the dresses, as they thought they were from the store. Ever resourceful, when her first three children were young and times were tough, she sewed their clothes using fabric from feed and flour sacks. She worked on many quilts, even during the over fifteen years she worked at the sewing factory. In later years, she couldn't sew due to unsteady hands and diminishing eyesight, but needlework was so ingrained in her that towards the end of her life, when she was in the hospital bed and her mind was affected by medication, she thought she was sewing. Her hands, much larger and sturdier than her small but wiry body, would weave the air as she pulled an imaginary needle and thread. Granny kept her hands busy weeding, watering, and nurturing plants. She never met a flower she didn't love or one she couldn't keep alive. She inherited her green thumb from her mama, who also adored gardening. Her affinity for bright, beautiful flowers never faded, even when she was no longer able to tend to a garden. When she was given indoor plants for gifts, she managed to keep flowers gorgeous. Even during her final months when she was a skilled nursing facility and she couldn't water them herself, the plants seemed to bloom and prosper in her presence. She wrapped her hands around many mugs of steaming coffee during her life. When she was a child, they used to know how to make "real" coffee, as they roasted and ground the beans at home and boiled water on the stove to let them percolate perfectly. Her papa always said, "if God made anything better than coffee, he kept it for himself." She judged the quality of a restaurant by its coffeea�"Heaven forbid they should serve it weak or lukewarm- and her family knew to put the pot on before her visits, as she had to have a cup at all times. After she retired and as she aged, she stopped drinking an entire pot a day, but she continued to enjoy her morning cup for the remainder of her life. Despite her petite frame and small appetite for food, she was happiest when making sure her loved ones were fed. Granny used her hands to shuck corn, shell peas, dice potatoes into perfect cubes, salt and stir multiple pots of veggies and meat, slice pies, and serve others. The family would squeeze into her tiny kitchen in her modest house and load plates full of Southern comfort food. She always made enough for an army, whether she was feeding three people or fifteen. During the last few years of her life, she was physically unable to produce such massive meals, but her family would recreate the mass feedings and overeating. Granny would sit and observe them as they went back for second and third helpings. She would smile as they laughed and playfully poked fun at one another, perfectly content to be surrounded by her big, crazy family. Granny's hands were always petting and feeding an animal of some kind. Over the years, she had an array of dogs and cats of varying sizes and personalities. Her cat Scott, also known as Pokey, was truly a companion animal who gave her purpose during her Golden years. Thankfully, her daughter Sherron loves Pokey too; she derived comfort knowing he would be well cared for once she parted this realm. The only animals she truly despised were snakes, so it wasn't unusual for to take a shotgun or a garden hoe to scare off or decapitate a rogue rattlesnake or two, who were likely sorry they'd slithered into her yard. The same regret was shared by those who underestimated her by thinking she was just folksy, sugar-sweet little lady didn't know much. Granny, who didn't suffer fools, would put people in their place using sharp wit and feisty indignation. 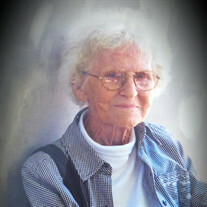 Granny used humor to bond with people and deal with life's challenges. She enjoyed keeping people of their toes and delighted in knowing they thought she was funny. She would use her hands to jokingly point at someone while giving them the stink eye, or to essentially play chicken to see who would move their hand first. She had amazing reflexes so usually she won this little game. A couple months before her passing, she asked to hold a mirror to check out her hair. She gazed at her reflection, touched her hand to her face, and sarcastically said, "Aren't I pretty." In reality, whether as a young, svelte woman with dewy skin and bright red hair, or an elderly woman with coarse grey hair and wrinkled skin, her compassion for others, her intelligence, her kindness, her humility, and her resilient spirit made her one of the most beautiful women to ever exist. She frequently held her hands together to pray to a God she believed in wholeheartedly. Her foundation in her faith enabled her to be the amazing and unique "Granny" to all, daughter, sister, cousin, aunt, wife, mother, grandmother, great- grandmother, and friend during her time on Earth. She worked tirelessly. She gave love freely. After nearly hundred years of living life to its fullest, it was time for her to let her hands rest. Now she is cradled in the loving hands of God.